Today we are not doing much driving. We are going bushwalking so it is an early start. We are up by 7:30 am and gone by 8:45 am. 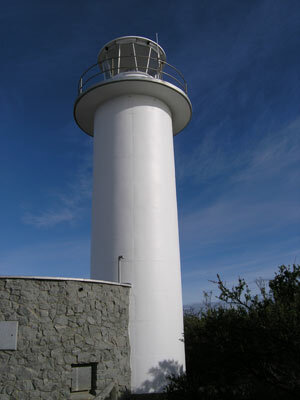 First we go to the lighthouse. As mentioned yesterday, this is just up the road from where we are. 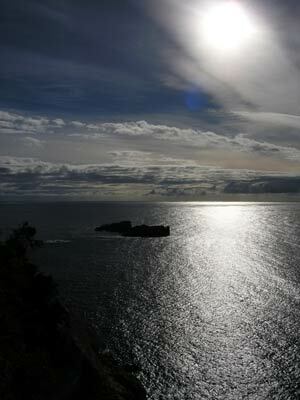 There is an excellent 20 minute walk that goes around the headland clifftop. Amazing views in all directions. We go to the national park visitor centre and get a walking track brochure (they are not on their web site) and book our camping site. Luckily we have remembered the number of the site we want and it is empty. Cost is $12. This is one of only a couple you can drive your car into, important when your tent is on the car. All the sites are constructed of a gravel base held in place by a border of timber with a timber fence around all but a small section of the four sides. All are separated from each other and private. Each one has a track to the beach. More about this later. We drive to the car park for the start of the walks. 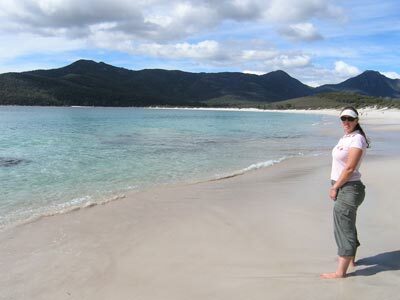 We plan to walk to Wineglass Bay. The car pack is very full, even at 10:00 am as we head off. 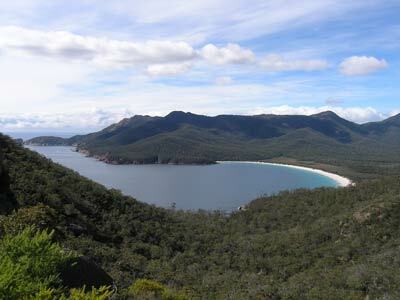 It is a relatively easy 25 minute walk to the Wineglass Bay Lookout. This has fantastic views over the bay, some of the best you will ever see. There is a yacht anchored in the bay but as we watch, it sails out. It takes another 20 minutes to walk to the beach. Here we have morning tea. As we sit here, Kelly notes that the beach looks like the one on Lost, with people all over the place. She is right. We take our shoes off and start to walk to the other end of the beach. It takes 30 minutes to get there. The water is quite nice, I should have bought our swimmers with us. There are many people swimming. The water is crystal clear and the beach almost perfect sand. As we walk along, a charter boat from Coles Bay arrives with a lot of tourists. The easiest but most expensive way to get here I suppose. It would actually be quite a spectacular trip I would think. At the end of the beach we sit and talk about how we will come here once we purchase our catamaran (in about 2015). After a while we walk back along the beach. Once at the western end we take the Hazards Beach walk. This is flat and takes about 30 minutes. It is quite a nice walk. 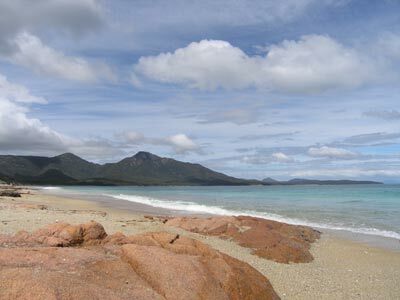 Hazards Beach is a lot different to Wineglass Bay. The beach has a lot of timber washed up on it and the sand is a lot coarser. The dunes behind the beach have been cut away by the southerly seas and there are what appear to be dozens of Aboriginal middens (piles of eaten shellfish) all along the beach. It takes us 30 minutes to reach the western end of the beach. Along the way we see a dead penguin. We have lunch at the end of the beach, as do many other people who have the same idea as us. After the beach we walk through a coastal heath and bush environment. Just after the end of the beach there are two small beaches where you could stop and have a swim or lunch. It is a very nice and relatively easy walk back to the car park, with views of the water most of the way. It takes about 90 minutes from the beach. We arrive back at the car park just before 3:00 pm. We go to the camp site and have a swim to cool down. It is cool in the water but it certainly does the job. 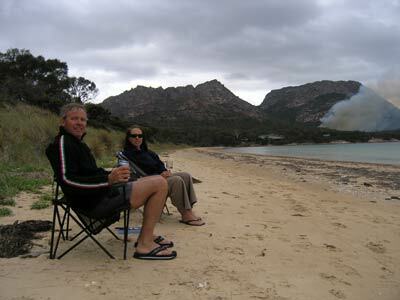 After this we decide to drive to the town of Coles Bay to have a beer. However, once there we find there is no hotel, only a general store. We have a look at the powered site area and find it very cramped and not all that nice. We also find the rubbish disposal area which is next to the powered sites and get rid of a lot of rubbish we have been carrying around for days. We go back to the camp site and set up. As mentioned, the site is right on the beach and just down the track is a water tap and a bit further on there is a brand new toilet block. This has male and female flushing toilets and cold showers. Once set up, we take our chairs down to the beach and have some good Australian sparkling wine and beer with King Island camembert cheese. Great! After this we have the luxury of a hot shower using 10 litres of water each. Kelly cooks sizzling steak with bok choy, capsicum and noodles. It has been threatening to rain since 4:00 pm but we do not get any before we go to bed at 9:00 pm (walking does take it out of you). It rains a bit overnight but it stays mild. After the beauty of the past few days, it is hard to see that anything will top this location so we are sad to leave. We head off at 8:50 am and as we approach Bicheno we see that the seas are almost flat and the water blue. We go to the boat ramp and see the dive boat just heading out. I am thinking we should be out there diving with them. We see a penguin in the water here and it is just lazing around. We go to the lookout which is between the ramp and the town. 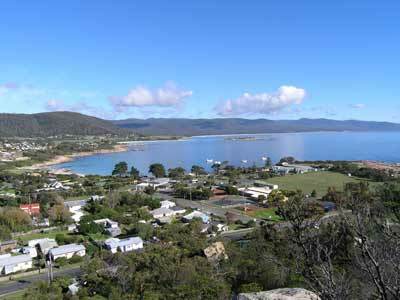 It is a 20 minute round trip and you get some great views of the town and ocean. We go to Rose's Cafe again and Kelly has Florentine eggs while I have another Devonshire tea. After this we drove to the dive shop and book onto a dive in the afternoon. This means we have a while to kill so we go to Waubs Bay and sit on the beach reading the newspaper and books. I make lunch while here and at 12:30 pm we are back at the dive shop gearing up. We go out to The Trap North Reef. This is quite nice and there are lots of fish and large abalone. The water is much cleaner and we have a nice dive. 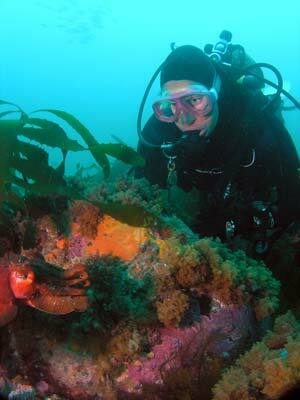 Click here to read about this dive. After the dive, we go back to the dive shop and wash our gear. 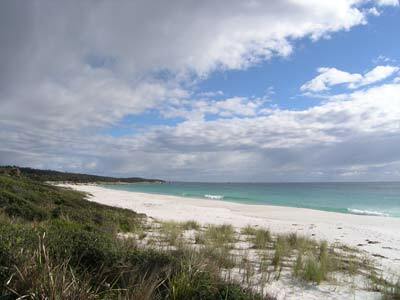 We leave Bicheno at 3:30 pm and continue north on the Tasman Highway. 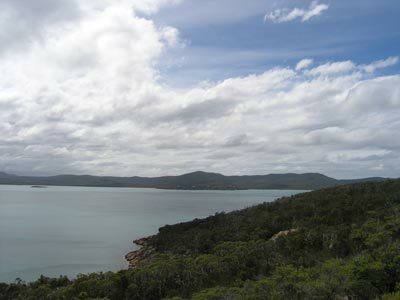 We are heading to the Binalong Bay area which is just over 110 kilometres away. 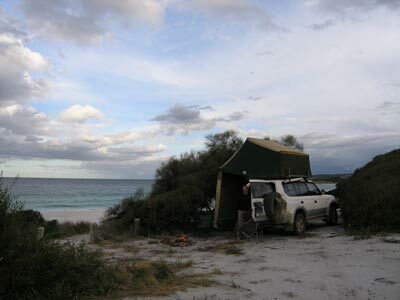 This is a spot that is located at the southern end of the Bay of Fires. We stop at Scamander for an ice cream at 4:15 pm and then leave about 8 minutes later. We arrive at St Helens at 4:38 pm where I buy some sparkling wine for our last night's dinner. We head out to Humbug Point (5:00 pm) and there are some reasonable camping sites here. On the way to Binalong Bay we cut some timber for a fire and at first miss we miss Binalong Bay itself as there are very poor sign postings. 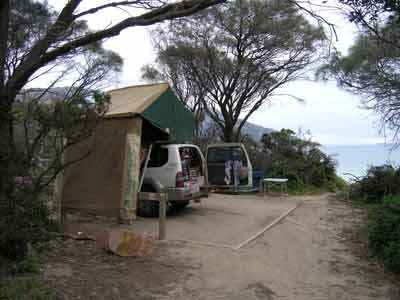 We decide to go north of Binalong Bay as there are a lot of camping areas in the area. We go to Grants Lagoon, heaps of space but unpleasant looking. We then go to Jeanneref Beach, it is small, about 10 spots but low bush and not much protection for the strong winds blowing. At 6:00 pm we arrive at Swimcart Camping Area. This is a very nice spot with lots of sites right on the beach. We find a spot about half way along the beach and sheltered a bit by a large bush. We need to level the site a bit by digging holes for the two right wheels and raising the left ones, but we end up with a flat spot. There is a toilet here as well as what appears to be the remains of an old shop that is now a shelter. There is a lot of dark clouds and lightning to the south and south-west and it looks like we may cop it. We put up the rear tarp and the front side curtains. I must say that overall, I am a bit disappointed with The Bay of Fires. It is nowhere as nice as I expected it to be, although some bits are nice. We sit watching the surf, lightning and have a few beers with cheese, smoked oysters and biscuits. The beach is beautiful, white sand with rocky outcrops to the north and south. Later I cook porterhouse steaks and lamb and mint sausages. It is a mild night and we go to bed at 9:00 pm as we are exhausted. We read for a while before going to sleep. During the night it rains for about one and a half hours.